Has the GOP already broken its promise on spending? By Robert Farley on Tuesday, January 11th, 2011 at 10:56 a.m.
Rep. Nancy Pelosi turns over the gavel to the new House Speaker, Rep. John Boehner. 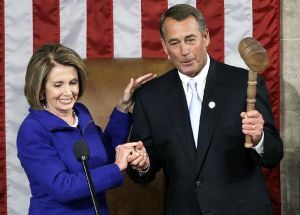 House Speaker John Boehner hadn't even had a chance to scuff his new cartoon-sized gavel last week before Democrats were claiming the Republicans had already broken one of the core promises of their Pledge to America -- the vow to cut spending to "pre-stimulus, pre-bailout" levels. How could they break a promise before they even considered a single piece of legislation? Democrats contended it was simply because Republicans tried to reset expectations for what it would take to keep the promise. The expectations involve how the promise was worded in the Republicans' Pledge to America, which was introduced Sept. 24. The GOP said the cuts would amount to $100 billion worth of savings "in the first year alone." In a radio address a month later (and just prior to the mid-term elections that would sweep Republicans back into a majority in the House), Boehner said the plan would allow Republicans to save taxpayers $100 billion "almost immediately." Last week, the parties began to quibble about the specifics. Republicans said they would propose cuts that would return spending to pre-stimulus (2008) levels, but because the 2011 fiscal year will be nearly halfway over by the time they have a chance to enact a spending plan, they won't be cutting $100 billion by the end of this fiscal year (which ends in September). Still, they vowed to get to that number within a full calendar year. Promise broken! said White House officials and other Democrats, who accused Republicans of trying to move the goal posts. PolitiFact will be tracking the progress of promises by by Republican leaders on our new GOP Pledge-O-Meter, and so we felt compelled to weigh in. The intensity of the pre-game jockeying says a lot about the political climate these days. Both sides are already trying to lay a foundation for their talking points in the 2012 campaigns. For Republicans: They are reining in out-of-control spending by Democrats. For Democrats: Republicans may talk a good game on spending cuts, but they don't have the courage to make them. "When Congress returns, we should force Washington to cut non-defense discretionary spending to 2008 levels – before the 'stimulus' was put into place," Boehner said. "This would show Washington is ready to get serious about bringing down the deficits that threaten our economy." In subsequent speeches and again in the Pledge to America, Republicans used a few key phrases to isolate the kind of spending they would not cut. Boehner talked about exceptions for "seniors, veterans, and our troops." In federal bean-counting circles, that translates to "non-security discretionary spending." So it doesn't include mandatory entitlement spending for things like Social Security and Medicare -- which account for most government spending. And the buzzwords dropped by Boehner further limited the discretionary spending to exclude defense, homeland security and military construction and veterans spending. Curiously, this has nothing to do actually with stimulus or bailout spending. The stimulus and bailout appropriations weren't a part of the 2010 budget, though we think the clear implication is that those programs bloated the spending that Republicans will now come in and cut. They're two different spending buckets. So when Boehner and other Republicans repeat the mantra that they want to return to "pre-stimulus, pre-bailout levels," it's really just a clever way to link the often-unpopular initiatives with Democrats. Actually, they're just referring to 2008 spending. Any time marker would work. They could as easily have said they would return spending to "pre-Justin Beiber levels." In the run-up to the midterm elections, Republicans put a number to their goal: $100 billion. In the Pledge, for example, the GOP promised the cuts would save "at least $100 billion in the first year alone." That's what it would take to get to the $378 billion figure in 2008 (based on early budgets proposed, but never enacted, by Democrats). The critical question about the $100 billion promise then is how to define "the first year." Some Democrats say that's the 2011 fiscal year -- which started in October and runs until the end of September 2011. Failure to do it in that time would constitute a broken promise, they contend. But the timing isn't so clear-cut. When the Republicans introduced their Pledge, there was no 2011 fiscal budget in place. Instead, the government essentially adopted a stop-gap budget called a continuing resolution, which continued spending at 2010 levels until March. When Republican staffers started warning reporters not to expect $100 billion by the end of the 2011 fiscal year (which ends Sept. 30), some media outlets suggested Republicans had backed off their pledge. An AP story, for example, matter-of-factly stated, "Their pledge to cut $100 billion from the budget in one year won't be kept." On ABC's Good Morning America on Jan. 5, anchor George Stephanopoulos told new House Majority Leader Eric Cantor, R-Va., that it seemed Republicans had scaled back their $100 billion pledge. "The $100 billion was based on the fiscal year," Cantor said. "And what happened, as you know, is when the Democrats ended the session last time, they didn't pass a budget. So we're in a situation where we have no budget right now. And we're going to work hard to bring spending down to '08 levels ... We are going to accomplish more than $100 billion in cuts over the term of this Congress." "But not the first year, as you promised?" Stephanopoulos asked. Said Cantor, "What we promised was we're going to bring spending down to '08 levels. Okay?" Conservatives say Republicans deserve time to produce a full budget. "I think conservatives should strive to cut as much as is reasonably possible in 2011," said Brian Riedl, lead budget analyst at the conservative Heritage Foundation. "But the fiscal year is going to be half over. I would cut them (Republicans) some slack on this. They should be given a chance to write a full budget before they are judged." Some Democrats say that's hedging and have made a steady stream of allegations that the Republicans have already broken their promise. But not all liberals are buying in to that line. "I am more than willing to say that Republicans are being hypocritical, but I don’t think that's the case with this pledge to save $100 billion," said Jim Horney, director of federal fiscal policy at the left-leaning Center on Budget and Policy Priorities. Horney thinks if Republicans cut spending to a rate comparable to 2008 levels for the remainder of the 2011 fiscal year, they will have kept the promise. Horney estimates it would have required about an 18 to 21 percent reduction in spending starting on Oct. 1, 2010, to have attained the $100 billion goal in FY 2011. If Republicans cut spending at that rate starting in March, they'll get the the $100 billion goal within a calendar year (March to March). Horney estimates Republicans will have to cut $60 billion worth of spending through the remainder of this fiscal year to put the budget on a course to sustain 2008 spending long term. "If the real goal is to get to that level and keep it there," Horney said, then they would not get to $100 billion in FY 2011, but he still thinks they would be staying true to their pledge. "It's tempting" to want to accuse Republicans of breaking their promise by not cutting $100 billion by the end of September, he said, but ultimately unfair. "There are plenty of things I think they (Republicans) are being hypocritical about," Horney said. "I don’t think this is one of them." However, Horney's support for the Republican timeline to meet their pledge is not an endorsement of the plan to slash spending to 2008 levels. Horney believes such cuts are "misguided and bad for the country" and he finds the Republicans' lack of specificity about where exactly they plan to make cuts troubling. Politicians like to talk about cutting fraud and waste, but to get to the kind of savings Republicans have promised will require deep cuts in popular programs like education and the FBI, he said. Ultimately, he thinks the American public will push back when they see the details of what the cuts actually entail. Can they keep the promise? Ultimately, it will be difficult for Republicans to fulfill the promise. Democrats control the Senate and have signaled they are not inclined to support significant cuts to politically popular programs. But Republicans aren't shying away from the $100 billion marker. In fact, they aren't even asking for a full year calender year from March to get there. "I will say this: We will meet our commitment to the pledge in this calendar year," Boehner said in a press conference on Jan. 6, 2011. "There's no ifs, ands or buts about it." Boehner may have been guilty of a bit of rhetorical excess when he talked about cutting $100 billion "almost immediately," especially when it was clear that a continuing resolution was in the offing and that the fiscal year would be nearly half over by the time a Republican-controlled House would have a crack at spending cuts. But we think the overriding promise here was to cut non-security discretionary spending to 2008 levels. And we think the Pledge's language about cutting $100 billion "in the first year alone," while ambiguous, does not confine them to the 2011 fiscal year. In fact, cutting $100 billion in the seven months remaining of the 2011 fiscal year would actually set the budget on a pace below the 2008 levels. So in rating this promise on our Pledge-O-Meter, we'll assess their overall success at returning to 2008 spending levels, on a pro-rated basis for the remaining months of this year, and in the 2012 budget and appropriations. So enough jockeying. We're watching to see how they do.